An album of 12 + 1 intermediate pieces for lever harp. 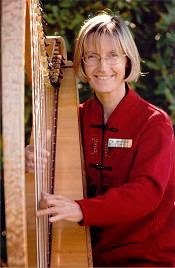 7 of the 13 are original compositions of Canadian Harpist, Alison Vardy and the remainder are "harp-friendly" arrangements of music from diverse cultures. Four of the 13 pieces can be played on a 26-string lap harp. All pieces are in keys of C, G, F or Am and two have single accidentals on either a treble C or F string. You can view the first 2 lines of each song by clicking on links #1 to #13 below.